Learn to use a pendulum - it's easy! This text was originally designed to be marketed to the teenage and young adult market, but also for “children of all ages.” I have tried to keep the language simple, and often I explain terms in several different contexts so that any reader can understand what I am saying. I hope my instructions for using a pendulum prove useful and bring you closer to Spirit! A pendulum is any heavy object that hangs on a line which is weighted. Pendulums can be made out of materials like crystal, wood or metal, and other simple objects found in your home. One of my favorite ways to make a pendulum is to use a cork. Insert a sewing needle in the top of the cork, and then thread the needle with string. Voila! You now have a pendulum! Other ways of making a homemade pendulum are to use a heavy ring on a chain. But I have used a bookmark with a tassel (in a pinch) – and even my car keys!! So the point is, you can use just about anything that is weighted, suspended on a string which will generate swing. Use your imagination or select from many commercially available pendulums. Once you have found a pendulum that you like and that works well with your energy, keep it for serious (yet fun) inquiries with Spirit. The pendulum that I use most of the time, I treat as a personal sacred object and don’t loan out to many people. To me, my personal pendulum is a sacred connection with my spiritual center, so I treat it accordingly. Is wood the best medium for me? Is metal the best medium for me? Silver, gold or copper? Is crystal the best medium for me? Is the best pendulum for me in this store? Would it be best for me to work with a home made pendulum? What Can I Use My Pendulum For? Pendulums can be used for many many things, but they are especially valuable for speaking with Spirit (your Spiritual Guides and Angels) and for getting information about your life from Spirit. You can ask your Spirit Guides through the medium of the pendulum almost any question, so these are some of the areas for you to explore with Spirit. Learn to connect with your Spiritual Guides and receive guidance. Find out why you are here. Find out more about your life. Find out about your past life. Talk to your pets; get information about their likes and dislikes. Verify the use of vitamin supplements and dosage. Check to see if fruit and vegetables are ripe. Using a pendulum will help you develop your psychic (spiritual) awareness and teach you how to receive the information that Spirit is already sending you. You just haven’t been listening! Once you learn to listen to the messages from Spirit, you may not even wish to continue using your pendulum. But if you are like me, you will find that using a pendulum is so fun that you will use it anyway, even when you know that the information you are receiving comes from Spirit. Thank the Universe, Spirit, your Guardian Angel, God, etc., for opening your center. Initiate a center of protection, by saying a brief prayer of protection, or simply visualize yourself in a bubble of while protective light. Also pay attention to any other additional feelings, thoughts, words, colors or images you get while you are receiving your response. As you quickly progress you will have your own special code that you and your Spirit will share together. Your code or connection with Spirit will not be exactly like your friend’s connection. Your pendulum may swing in small movements and you may also hear words in your head to your answer. Your friend may get a huge swing and see colors. Someone else might see pictures in their mind when they use their pendulum. Some of you may not at first get anything but a yes or no answer from the pendulum. What ever you do receive as an answer is right for you, and you are receiving exactly in the manner best for you at this time. By working with your pendulum and with Spirit, you will strengthen your connection with Spirit, with receiving and interpreting the information you receive, and also have a lot of fun! To begin using your pendulum, hold the string or chain between your first and second fingers, and allow the pendulum to hang down straight. Place your hand that isn’t holding the pendulum underneath the hanging pendulum with the palm of the hand facing upwards under the pendulum. The reason I put my other hand under the hanging pendulum is that it seems like I have a better energy flow with this method. It also “feels right” for me to do this. I can read information from Spirit and get results without my left hand under the pendulum, but the energy field feels stronger and more connective if I place my hand underneath. But do what ever feels correct to you. The key to getting accurate information from using a pendulum is to remain centered and clear. Being centered means that you are open to receiving information from Spirit and you are keeping your thoughts and feelings distanced from the actual information you receive. You become simply a reporter (even if what you receive is very exciting or interesting.) This is called being non-attached. Once you feel you are centered (open to Spirit but not involved with the information you get back), say a prayer like “I surround myself with the Spirit (or God) and Oneness of Light, to receive my highest good.” Or use any prayer or meditation that brings you peace and a connection with your spiritual center. Also, you can just surround yourself with the white light of Spirit. Next, start by asking Spirit the direction of “Yes” for your work with the pendulum. Clearing between questions is a good thing to do, especially when you are just learning so that you know for sure which questions you are getting a yes or no to. As you advance, you will be able to feel the energy change in response to a question, before the pendulum starts to change its swing. It feels to me like a pull in the energy field in front of my heart. Sometimes there is a slight change of temperature too. If this happens, you will know that you are advancing to a state of connection with the universe. Try to pay attention to any additional clues that may be coming into you as the pendulum is giving you a yes or no answer. At this stage it won’t be as important to clear between every question. But even I “clear” if I find that I start to get confusing answers or feel the energy is getting muddied. Sometimes this happens when a different Spiritual Guide comes in with an answer to a question, in a series of questions. I often also see the need for “beginners” to clear regularly because in their excitement, they simply tend to ask questions too quickly for Guides to respond. Beginners questions also tend to get complicated. Keep it simple; keep to yes or no answers. Ask a question and wait for the answer. Clear and give the next question. Yes, Spiritual Guides all have their own specialties. Most questions can be answered by your own Guide or Guardian Angel, but I find that if I am asking a technical question, like a question on my health, about vitamin supplements, about my computer, or a car, a different Guide comes through. To me different Guides seem to have different strengths in energy, or varying vibrations. I find that when my Guide doesn’t know the answer to a question in a certain area, the connection feels weaker to me. At such times, I just ask “Can you bring in a Guide that can answer my question on a health issue, computer question, car, etc. ?” (I actually have a separate Guide whom I refer to as “my driving Guide.”) When I change Guides temporarily, usually the pendulum will then go into a spin for a few seconds or even a minute. Finally I will feel an energy surge and my pendulum will start responding again. Next, ask Spirit to show you your “no.” The pendulum should begin to swing horizontally to you now (or sideways across your chest.) When you are satisfied with your swings for “yes”, “no” and “clear”, you are now ready to begin using your pendulum. The spinning circular response that happens when you clear the pendulum also can mean that you will not get an answer from Spirit regarding that question. Issues that are tied to your free will, love interests and issues of transitioning to the next dimension are personal and often not revealed. As stated before, the circular response can also mean that Spirit is going out to another source, perhaps to another Guide to get this information. If you try this with your friends taking turns with a pendulum, you will find that everyone has a different range of “swing” with their answers. Some people’s swing is very very tiny, some mid-range and some people receive very strong wide swings. Every range of swing is absolutely perfect for them. Someone with a tiny swing is receiving just as valid information as the next person. Sometimes if you try a different type of pendulum, a crystal one instead of a cork pendulum for example, you will get a clearer “read” and a larger swing. I haven’t met the person yet where nothing happens when they use a pendulum, but I’m sure someone out there will tell me that it just doesn’t work for them. You don’t even have to believe in pendulum work to have it work! Remember, that not everyone has the directions as described above for their pendulum swing. Mine are reverse of what I described and yours may be that way too. That is why it is important to test your direction for yes, no and what your clear looks like. Some people like to make a list of questions before they start working with their pendulum. If you do this you can then record your answers to test and compare against factual information if you like. (Or if you ask a lot of questions you may not remember everything without writing down the answers.) I usually pendulum with my right hand, but when I have a list of questions (like when I ask a list of detailed past life questions) I find I can pendulum with my left hand and write as usual with my right hand. Often I will also get additional information (a thought, a word, an image or a color may come to me), which adds to my yes or no answer. When this happens you are truly listening and receiving information from Spirit. Just believe! Pendulum work can help you open your psychic skills and become more sensitive to spiritual information. Penduluming of course is not 100% accurate, but with practice you may learn to rely on it more than other information that we live our lives by – like the local weather report! It is important to remember that when you are working with your pendulum, you are really communicating between yourself and with Spirit. So, keep to the golden rule, and don’t ask or inquire about things that you wouldn’t wish to be asked about yourself (if it’s not your business don’t pry!) Never discuss the timing of transition of another soul. The length of time each of us is here on earth is between us and the Creator and should not be a subject of conversation. If you do become aware through psychic means that someone will transition soon, you should not discuss this with the person. I encourage you to keep your communications light and in a positive manner, and yes it’s completely acceptable to have fun and to play a bit with your pendulum. The more you use it, the more you will open to this and other psychic abilities. Once you begin to open your spiritual center it will continue to open, sometimes all at once, but more often just gently and gradually. Only by saying to Spirit, that you wish to stop the development will it stop. So, just be certain when you start such opening that you are really ready to experience what might unfold. Pendulum “Games” and Advanced Uses. When you are learning anything, the more you apply what you know, the more your knowledge will grow and the more experienced you become. Games are a wonderful way of building your reading skills and enjoy working with your pendulum. Learn to locate objects by playing find the coin. Quarters work really well with this game. If you have a large rug, have a friend hide a quarter or coin under the rug or blanket. See if you can find where the coin is by the pendulum swing. 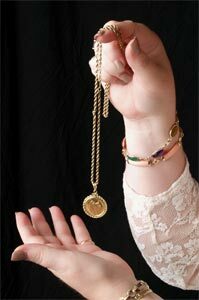 When you are over the position of the coin, the pendulum swing will change from a “no” or “circle” to a “yes. Before you start, ask Spirit if they will help you find the coin. Variations of this game are to have one person hide an object around the room or house, then have seeker find the object. (Or each person could hide a separate object at the same time, and then you could see who finds their object the fastest.) An advanced part of the game could be to try to first identify what you are looking for. Ask a series of questions to the pendulum, and try to get inner clues as to what you are looking for. After you know what it is, then actually go look for it. You will be asking yes or no questions to Spirit most of the time. The simpler your question is the better. Beginners often make their questions too vague, or say one question on top of the next. If there is a group of people asking questions, one person at a time should speak. If too many people are talking to the person penduluming, that person will not get clear information. It is possible to get much more information about what you are inquiring about by asking a range of questions and allowing the pendulum to respond to a series of questions. Ask about someone’s age: Is John 1?,2?,3?,4? etc. If John is older, start with: Is John 20?, 30?, 40?, 50? Etc. The pendulum will give you a “yes” as you approach an age. If you are uncertain between two answers, stop and clearly ask first, “Is John 28?” Wait for the answer, and then ask “Is John 29?” Wait for the answer. One answer should end up with a definite yes or no. You will be astonished at the accuracy of working with the pendulum, as it is communicating with universal wisdom. It is possible to affect the answer your pendulum is giving you, even when you think you aren’t. Each time you communicate with Spirit you must be centered and set your own expectations aside. The most difficult area for people to remain centered with is regarding questions about love. It is almost impossible for individuals to set aside our desires surrounding our hearts, so it is better to go to a disinterested party when you are asking questions about your love life. You can also find out when it is likely for something to happen. You can ask, “Will such and such happen in 2005?” Then you can determine the month of the likely event by going through the months, waiting for the pendulum to swing positively over a certain month. Divining the future is not as easy as determining something that already is, since there are many things that affect the future. Everyone has free will, and individual choices affect what happens. There are always more than one possibility that something will or won’t happen, but quite often there is a stronger possibility of an event happening or not than another. If you center yourself it is possible to determine the likely probably of something happening, and check on the percentage of possibility of the event happening. I find it is much easier to ask about future events for other people than for myself. Also, I sometimes get a clear reading on a month or the season something will happen but I might get the year it occurs totally wrong. That is very common for me. And then there are the times when the information I get is TOTALLY wrong. The fun is when you start to see the times you get it right, and when the frequency of those right predictions increases. When I ask if event “x” will happen, I sometimes hear a number along with it, perhaps “2.” This could mean 2 hours, 2 days, 2 weeks, 2 months, etc. I usually can feel if it is sooner rather than later (like 2 days feels much closer than 2 years). Psychic flow is just that, it can increase and decrease. Some days information can come in strongly as clear as a bell, the next day it may be like grasping for a thought just out of reach. But the more you use your psychic ability the stronger you and clearer your channel will open. As mentioned earlier, using your pendulum to help you regress yourself to a past life is another advanced technique. Ask your Guide through your pendulum if you are ready to do this. If you are, a partner may be helpful to ask questions and record the answers, or you can also do it on your own. If working by yourself, have pen and paper handy or tape the session on a recorder. Most likely you will go into a light trance while you are doing this, but you should be able to remain conscious. It is important to record what you receive, because shortly after your session ends, most likely the details of what you experienced will leave you. This is a characteristic of Spiritual connection, when you return to this plane; all but the most vivid experiences are soon forgotten. By working with Spirit through a pendulum you can enrich your life in many ways. There are also other ways to communicate with Spirit but this is a simple way that many people quickly understand. allowing your true higher Spiritual self to unfold.